You are here: Home › BELLUGA GOURMET S.L. 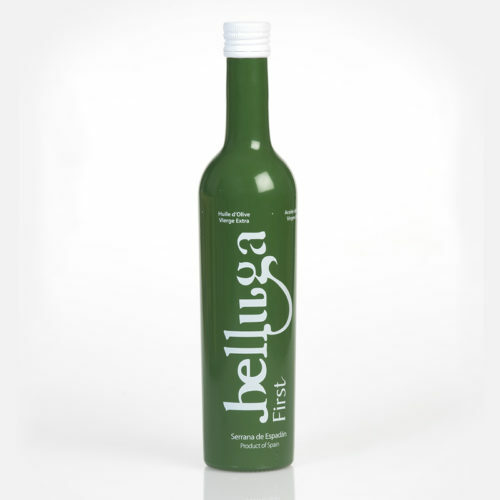 Extra Virgin Olive Oil, cold-extraction, unfiltered. Made from the first selected olives of the harvest. PRESENTATION: 500 ml glass bottle. FEATURES: TASTING NOTES Color: golden green Nose: medium-high intensity of fruity, highlighting green notes of olive leaf and tomatera Mouth: sweet entry that gives way to a slight bitterness and remarkable spicy, persistent in the mouth with memories to alloza and nuts. INDICATIONS Medium intensity oil in which combine green and ripe notes, suitable for harmonizing fruits (orange) and chocolates, as well as vegetables and steamed vegetables.